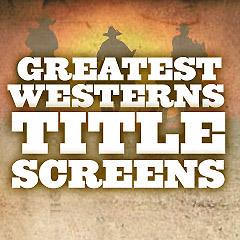 Movie Title Screens - Greatest Westerns: Title screens are the initial titles, usually projected at the beginning of a film, and following the logos of the film studio. They are often an ignored aspect of films, although they reflect the time period or era of the film, the mood or design of the film, and much more. Westerns are the major defining genre of the American film industry, a nostalgic eulogy to the early days of the expansive, untamed American frontier (the borderline between civilization and the wilderness). They are one of the oldest, most enduring and flexible genres and one of the most characteristically American genres in their mythic origins. The popularity of westerns has waxed and waned over the years. Their most prolific era was in the 1930s to the 1960s, and most recently in the 90s, there was a resurgence of the genre. They appear to be making an invigorating comeback (both on the TV screen and in theatres). Modern movie remakes, such as 3:10 To Yuma (2007) and the Coen Brothers' True Grit (2010) have also paid homage to their mid-20th century predecessors. See also: Greatest Westerns of All-Time including plot synopses.